We were wondering what Tiffany Haddish’s natural hair would look like without extensions, so we looked online. So we looked online. We found videos of Tiffany Haddish’s hair going from blow dry into lace extensions. Yes, long to watch, but she talks the whole time — monologue mixed with life advice. REAL TALK FROM THE CHAIR: Tiffany Haddish warns against wasting your life on “Who bit Beyonce” stuff. Care about the real people in your life, not celebs. Focus on what matters, like helping your kids with their reading, etc. Anyway, back to her hair. Watching her toss it around, visibly transformed by the movement. the length — that moment when . She’d proudly wear this to Walmart. We admit we’re emotional but the scene melted us. Bad picture — taken from a video. But she loved her blown out hair. Nothing grows hair longer than a keratin treatment — because nothing else structurally strengthens hair the way like keratin. Uncurly attaches a strengthening, restorative coating to individual hair molecules, linking them together for longer strands than ever before possible. Again and again clients claim Uncurly made their hair grow faster, but what it’s really done is eliminate breakage so they retain growth that was already happening. Extensions are everywhere. They seem like an easy solution to getting longer, fuller hair, but they bring their own set of serious drawbacks. So no, we’re not really fans of extensions. Instead, we believe in using keratin treatments on natural hair so it can grow long and style easily. 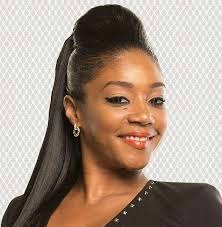 Tiffany Haddish’s natural hair appears to be a mix of 3C and 4A with good volume. A keratin treatment could dramatically lengthen Tiffany Haddish’s natural hair in ways that could make her quit extensions altogether. She wanted more length. Keratin applies a protective coating that eliminates breakage, letting hair grow much longer than before and edges to grow in fuller. Smoothness and motion. Keratin fills in the rough gaps in the cuticle, letting hair flow freely without tangling and giving a smoother look. Fast stretching/straightening = fast blow drying. Drying and styling time cut in half — the hallmark of a keratin treatment. Fast air drying into a looser curl. Keratin is great for curls. It gives a gorgeous, quick-dry wash and go with a loosened curl pattern. Fast drying, easy manageability. Keratin minimizes water retention, making hair air dry or blow dries in half the regular time. Or less. No shrinkage, frizz, or pouf in humidity and sweat. Frizz-free forever, both curly and straight styles. Styles stay without shrinkage or pouf. Like-new conditioning. Skip the big chop? Keratin restores heat and relaxer damage to like-new strength and feel, making it possible to transition without a big chop. Are you interested in getting off extensions and developing your hair’s natural potential — including longer length? We’re here to help. Feel free to ask us anything. Michelle Obama’s Hair: Are Keratin Treatments The Secret Sauce?